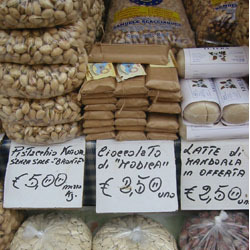 Most mornings I walk to the open-air market with no idea of what I will buy. 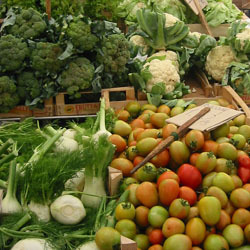 The fresh vegetable stalls are piled high with white and purple cauliflower, broccoli, plum tomatoes still attached to vines, fluted heirloom tomatoes, zucchini, fennel, potatoes, carrots, onions and eggplant all carefully arranged to form a patchwork of colors. There are leafy greens that I can’t identify near the familiar bunches of parsley, mint and basil. I bought a few small potatoes, one zucchini, and bunches of parsley and mint from the vendor who waited patiently as I figured out the correct combination of coins to pay him. 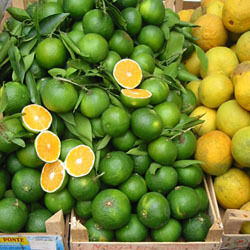 The fruit stalls are filled with citrus – blood oranges, mandarins, ordinary lemons and two-fisted, lumpy Sicilian lemons. One stall had five small containers of wild strawberries. They were three times as expensive as the more familiar cultivated ones but I couldn’t resist the extravagance. 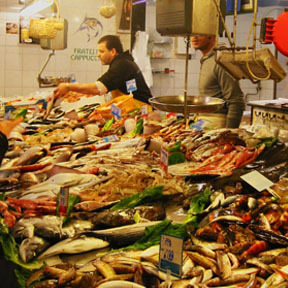 The fish section of the market is the most lively. 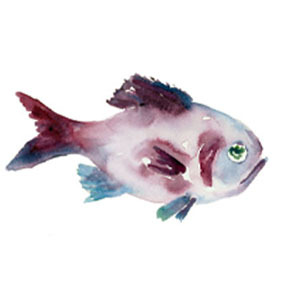 The loud calls of men selling fish and seafood fill the air with promises and banter that I don’t understand. 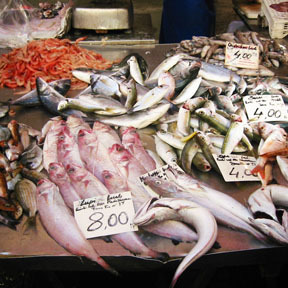 The metal tables are filled with squid, cuttlefish, three kinds of shrimp, cockles, mussels, sea urchin, octopus, fish filets, mustard-yellow dotted eels, small pink fish, and silver striped black striped fish. A large piece of fish ready to be sliced into steaks sat beside the up-ended head of the swordfish it came from. 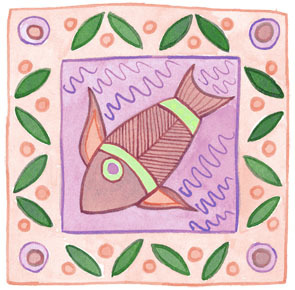 I decided on swordfish for dinner because it would be the simplest to cook. I used my fingers to indicate that I wanted a one-inch thick steak. I’ll deal with boning, skinning, filleting and cleaning the less familiar fish another day. 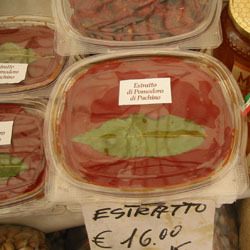 The vendors who sell ripe and green, brine and oil cured olives, also sell heads of garlic, and capers and anchovies preserved in salt. A spatula that looks like a putty knife sat on a large platter next to a mound of tomato paste made from sun dried tomatoes. I bought an herb blend marked Herba Tipico Siciliano and a small quantity of salted capers to experiment with. The smoky smell of peppers and onions roasting on a small charcoal grill at the end of the lane perfumed the air. This was the only stall where a woman was working. Her husband was in charge of roasting and negotiating sales and her role was limited to wrapping a pepper after I had paid for it. The cheese man tempts every passer-by with a sample. He reaches across the cheese case to offer samples of smoked mozzarella or provolone on the tip of his huge knife. When I pointed at the creamy cheese studded with red peppers, he used that same knife to create an instant sandwich with the cheese, bits of sun-dried tomatoes in olive oil and a crust of ciabatta bread. His smile was at least as sweet as the cannoli I bought from him for our dessert. My son Noah and I made sushi for lunch the day before we were to fly off to Sicily for our two month adventure. Noah cooked the rice and cut the carrots and avocado and I went to the market to get yellow tail tuna and ‘crab with a k’. 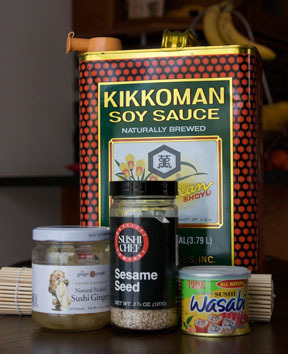 Crab with a k or krab is also called imitation crab meat or seafood sticks. Krab originated in Japan and is a type of processed seafood made of ”Surimi” or finely pulverized white fish. Along with the fish, I found pickled ginger powered wasabi and seaweed sheets called nori in the Asian Food aisle of the well-stocked grocery. 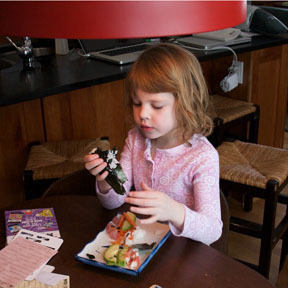 Ella made sushi hand rolls and Dylan opted for peanut butter. Noah and I made sushi for everyone else. Here’ how we did it . 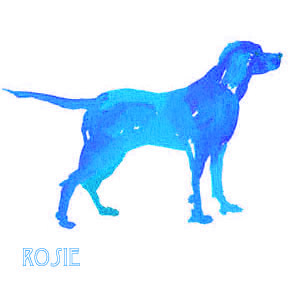 Rosie is feeling blue. Hiding in the closet didn’t work, standing outside and looking disinterested wasn’t convincing. After an undignified trip to the car, we resorted to a pharmacologically induced calm. After a couple of tranquilizers, her trembling and quaking disappeared along with her appetite. On the other hand, her human traveling companions, that would be me and Charles, shared an inspired salmon salad that combined poached salmon, ripe olives, mixed greens, feta cheese, red onions and Clementine’s. Proof that careful ordering is as important as careful cooking. 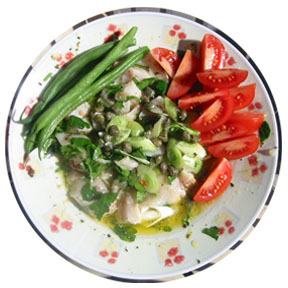 I don’t have a recipe for this salad (yet), but I look forward to combining fresh fish and citrus from the market in Siracusa as soon as I can and sharing what I learn. The conversation was more carefully considered than my salad that consisted of cold boiled potatoes, tuna and green beans from tins, a few nice olives and slices of hard boiled eggs, all dressed with a simple oil and vinegar dressing. I cannot remember if there was a lone anchovy on top or not. In spite of the minor shortcomings of the salad the date was an unqualified success – we just celebrated our thirty-first anniversary. Since that lunch, I have reconsidered the salade nicoise many times. I made a list of possible ingredients – tuna, potatoes, olives, green beans and anchovy are a must; supporting players include beets, onions, carrots, capers, parsley, dill, tender lettuce, and a vinaigrette. This recipe and presentation requires a fair number of bowls and steps but the results are worthy of your fanciest dinner party. 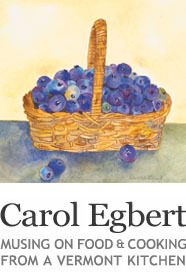 You are currently browsing the seafood category at Vermont food from a country kitchen – Carol Egbert.